A house without a roof is not a house at all. 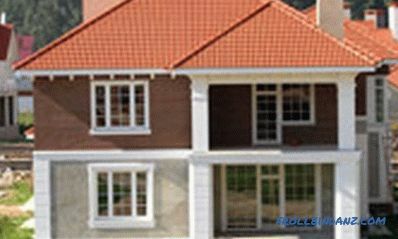 And to cover it, different types of roof are used: soft and hard, rolled and piece, flat and profile. Some of them are better suited for country houses and cottages, others for city houses, and others for economic buildings. 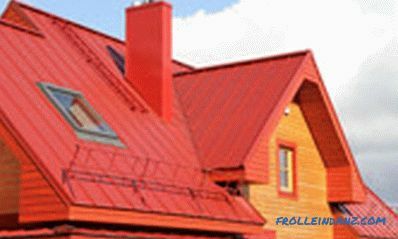 To make a specific choice, one must have an idea about the properties of each of the roofing materials. Metal tile is durable, beautiful, but noisy. 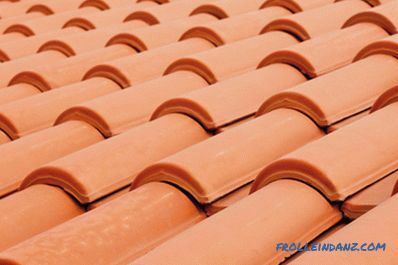 This roofing can sometimes be indistinguishable from expensive ceramic tiles. The metal tile contains a cold-rolled steel sheet (from 0.4 mm to 0.5 mm thick) with a zinc coating, which for reliability is covered with one of the types of polymers. A protective varnish is applied on top, and inside there are several more layers. This, in particular, is a primer, as well as a passivating aluminum coating. The finished sheet is very light - from 3 to 5 kg 1 m 2 . Installation. When installing the lower permissible slope of the roof is - 15 0 (there is no upper limit). With small slopes, up to 20 0 , it is necessary to hermetically isolate the joints between the sheets. To fasten the roof to the crate used screws with rubber pads. Overlap along the length of sheets can be from 45 mm. up to 150 mm. depending on the type of profile metal. An example of a batten for mounting a metal tile. The scope of the metal tile is very large. 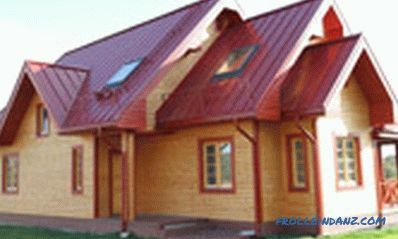 It is used as a roof for the roofs of private houses, buildings in production, as the roof of garages, kiosks. 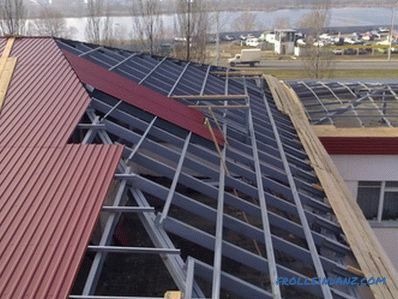 Often a flat roof is framed with a metal tile, putting it under a slope. The result is a false-roof. The durability of this material quite suits the buyer. From 30 to 50 years, nothing will become with such a roof. If we consider that for one square meter of metal you need to pay from $ 7 to $ 15, then this is a reasonable investment of money. Now specifically - about good and bad. the price is not very high. noise ( any sound is well transmitted through the metal). Separately It should be allocated composite metal. It instead of a polymer coating as a protective layer is used stone crumb deposited on the surface in a special way. 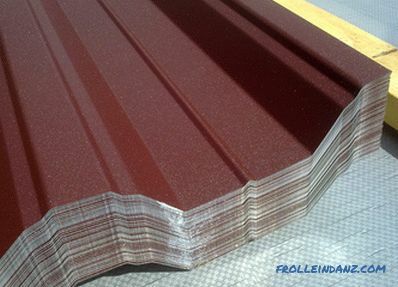 Profiled flooring (corrugated sheet, profiled sheet), like the previous material, is made of hot-dip galvanized cold-rolled steel. Sometimes for him the metal is taken thicker than for the metal tile. Sheets can have both a rectangular and wavy profile. On all sides, they are covered with a zinc or zinc layer. Top has additional polymer protection. The profile can have the form of a trapezoid, wave, rectangle. 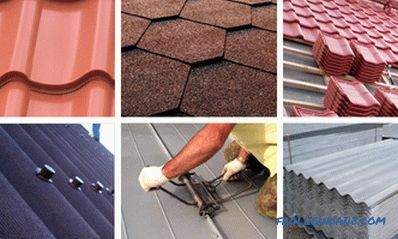 Roofing is profiled of the following brands: C8, C21, HC35, C44, H57, H60. Installation. The roof slope should not be less than 10 0 (maximum not limited). During installation, an overlap of about 20 cm is made, which is filled with sealant with a slight slope of the roof. Mounting produce screws, which is from 6 to 8 pieces per square meter. 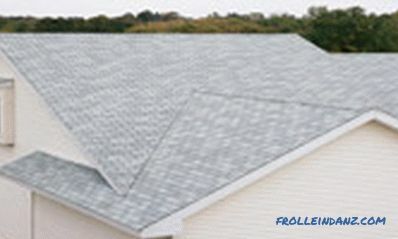 Sometimes the professional sheet is placed directly on the old roll roofing. 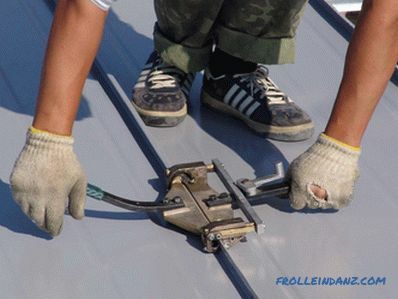 An example of metal sheathing for corrugated flooring, which is used when installing the roof for business and industrial premises. Scope. 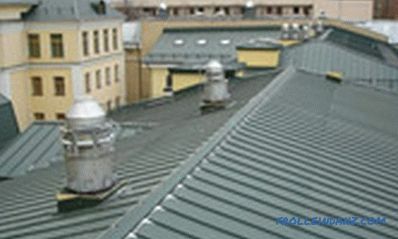 This type of roofing is more often used for commercial buildings, such as sheds and garages. Also, they cover the roofs of industrial enterprises, shops, car washes. Durability and price. Serves decking up to 50 years. It costs about $ 10 or more per square meter. 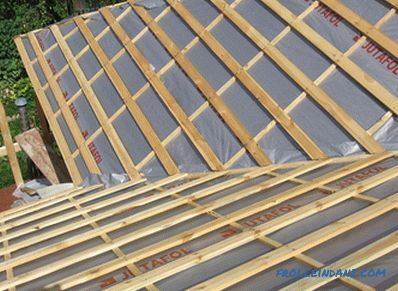 Sheeting refers to the "noisy" types of roofing of the roof, requiring mandatory sound insulation. This coating attracts with its naturalness and price. It consists of fine cellulose fibers impregnated with bitumen with polymer additives. It is called not only Ondulin, but also Euro-slate, as well as aqualine. Painted with heat-resistant polymer paint (in one or two layers), it looks very good. Sheets weighing 6.5 kg are made in the form of waves with a height of 3.6 cm. Their length is 2 m, width is 0.96 m.
Installation. 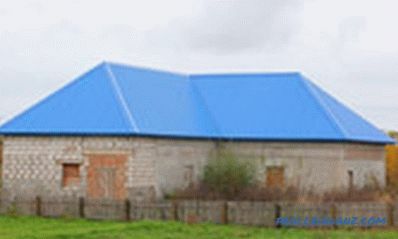 The minimum angle of the roof for the use of ondulin is 6 0 . If it is not more than 10 0 , the crate is made solid, making a longitudinal overlap of at least 30 cm. A slope from 10 to 15 0 implies a crate from a bar with a step of 45 cm. For angles more than 15 0 pitch is sufficient, about 60 cm. Special nails are used for fastening. Scope. Ondulin is often used to cover canopies, baths and garages. It is good for a complex roof, because it bends easily. 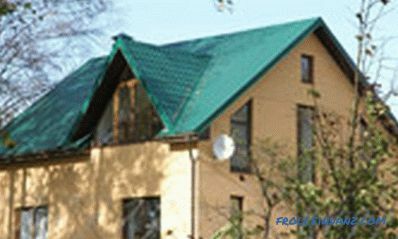 It is convenient to update the old roof (for example from slate) with this coating, giving it a new life. Durability and price. The service life in water resistance is 40 years. Paints, however, fade earlier. Coverage price of about $ 5 per sheet. in the heat it is impossible to climb on the ondulin roof - it softens and smells strongly of bitumen. In addition to Ondulin, there are Onduvilla is a kind of relative of Ondulin. Onduvilla has a more presentable appearance and other sheet sizes. As seen in the photo, her sheets are much narrower than those of Ondulin. 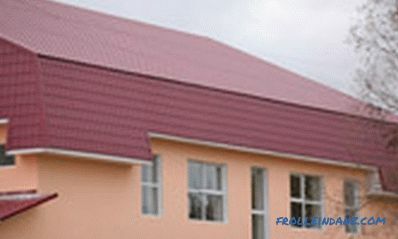 Of all types of roofing materials, this is probably the most affordable. 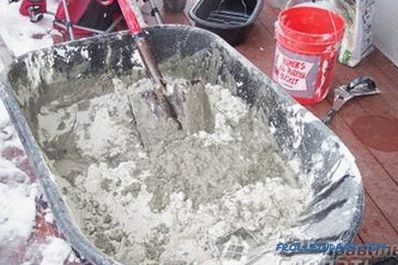 It contains 85 percent of Portland cement, the rest is asbestos. 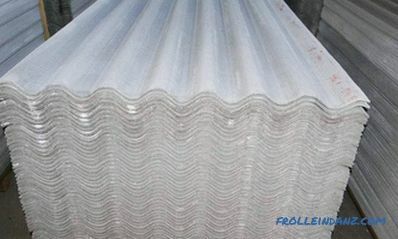 Standard slate corrugated sheet weighs from 10 to 15 kg. Its length is 1750 mm, width - from 980 to 1130 mm. It can be 6, 7 and 8 wave. Installation. Slate can be placed with a roof slope from 12 to 60 0 . When installing the required overlap sheets in one or two waves. Lathing of square bars with a cross section of 5 centimeters and a step from 50 to 55 cm is enough. In the case of slate with a reinforced profile and the bars are needed thicker (with a cross section of 7.5 cm), and the step of the sheathing is bigger (75-80 cm). Under the slate need lining of roofing material or asphalt. Under each nail also put a soft gasket. Scope. Slate, toilets and other buildings for household purposes are usually covered with slate. Private houses cover them only when the owners are very limited in funds. Durability and price. Slate service life - from 30 to 40 years. A square meter costs about $ 2-3.
because of its high hygroscopicity, the material accumulates moisture, which leads to fading and the formation of moss. 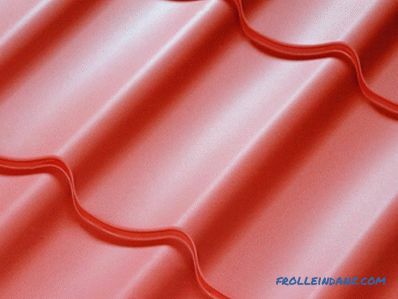 Smooth steel sheets, of which this material is made, do not allow moisture to linger on the roof. Steel is used with or without zinc coating. There may be a polymeric protective layer. 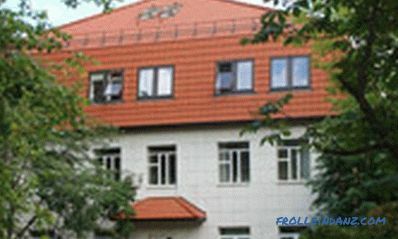 This roof got its name because of the special connection of sheets - fold. It can be recumbent or standing, double or single. The length of the sheets fasten together seams standing type, and the width - lying. Installation. When mounting, first fold the sheets into so-called "pictures" with curved side edges, focusing on the length of the slope. Do it downstairs on the construction site. Then, already on the roof, the side edges are joined by a standing seam. The paintings are fastened to the crate with narrow strips of galvanized steel - clamps. The roof slope for laying folded sheets should be at least 14 0 . In addition to crates of bars with a five-centimeter square section and a step from 20 to 40 cm, a film against condensate is provided. A slope from 7 to 14 0 makes the base solid. Types of folded joints used for mounting a folded roof. Scope. It has long been used such a roof for the roofs of cathedrals and homestead-type houses. Cover it and industrial buildings. Durability and price. This coverage is from 25 to 30 years. Its price is from $ 5 to $ 7 per square meter. greater noise level of the roof. These roof coatings are good because they are not touched by the main enemy of the metal roof - corrosion. 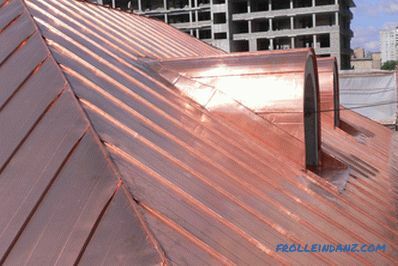 Copper sheets with a thickness of at least 0.3 mm are made with a length of 1.1 m and a width of 0.7 m. A square meter of such a roof weighs from 5 to 10 kg (aluminum - 2-5 kg). Installation. The roof slope must be at least 15 0 . Installation is the same as in the case of steel coating. 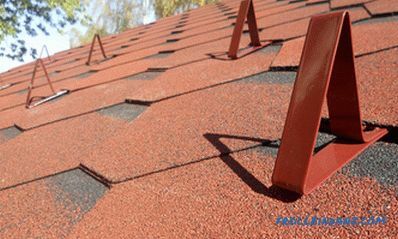 Only fasteners are taken, depending on the roofing material, either copper or aluminum, but not steel. Otherwise, corrosion quickly "eat" the roof. Durability and price. 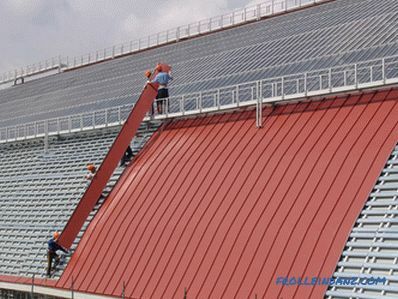 The film, which after some time forms on the roof surface of copper or aluminum, does not allow them to collapse. 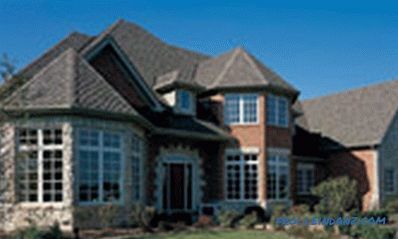 Therefore, the seam roofs of all types of roofing are the most durable. Copper - up to hundreds of years, aluminum - up to 80 years. However, the prices for such pleasure are hefty. A square meter of copper folded cover will facilitate your wallet in the amount of $ 30-40 (and sometimes more). 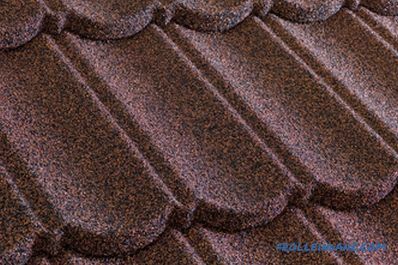 This coating is also called shingle, shiglasom or simply soft roof. For its production, the basis of fiberglass is impregnated with bitumen with a modifier, and stone powder (basalt or slate) is applied on top. 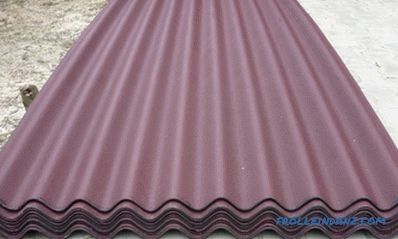 It also gives the roof UV protection, color and volume pattern. 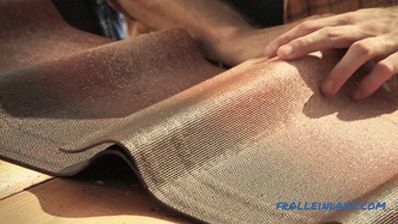 A self-adhesive layer of polymer bitumen is applied from the inside. Installation. The minimum slope of the roof for its installation is - 11 0 . 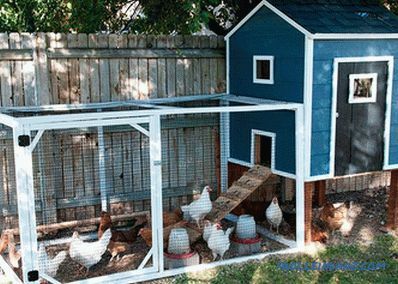 Under this coating requires a continuous crate, made of waterproof plywood or OSB. 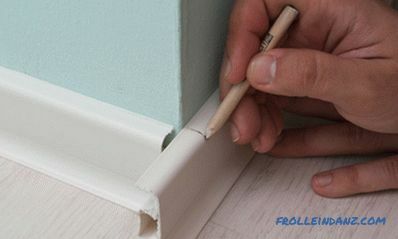 At angles of inclination up to 18 0 it is better to spread an additional layer of the roll coating. Example of the base for laying shingles. Scope. 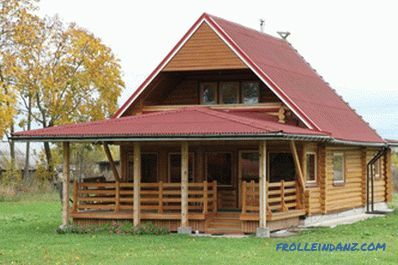 It is good to use this roof on roofs of complex shape, as well as in the presence of an attic. Durability and price. Its service life is up to 70 years. 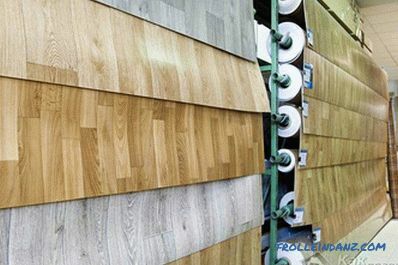 Its inexpensive brands cost $ 5-10 per square meter. It is also called waterproofing or stekloizola. However, some manufacturers give this material their names, but the content of this does not change dramatically. 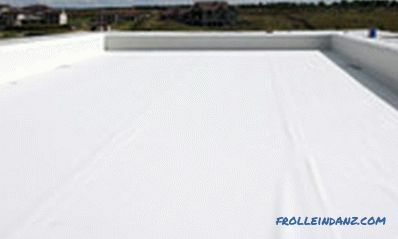 This coating is made on the basis of fiberglass, fiberglass or polyester. Polyester is durable, but expensive, fiberglass is also not bad, but fiberglass does not shine with quality. The base is filled with oxidized bitumen, in which one of the types of modifiers is added for elasticity and durability. It is either SBS (styrene-butadiene-styrene) or APPP (atactic polypropylene). Then there is a layer of polymer and sanding, shale or mica dressing. Installation. The roof slope at which this material can be used must be at least 11 0 . On a solid base (made of wood, metal, concrete or flat slate) insulation is placed, on top - waterproofing. Next, apply a primer or gasoline, dissolved in bitumen. Using a gas burner, stick roofing carpet, starting from the bottom. The end and side overlaps make at least 10 cm. The flat roof is covered with roll-up roll roofing. Scope. 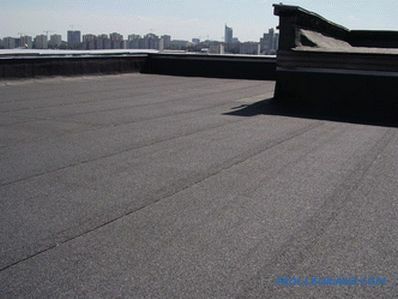 This coating is used on the flat roofs of multi-storey buildings - residential and industrial. In a private house from it you can build a waterproofing. Durability and price. This roof serves up to 50 years. Price per square meter - no more than $ 2.
rolls should be stored only in a standing position, away from heating devices. Membranes are from 0.8 to 2 mm thick. 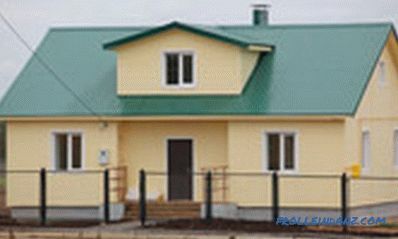 They can be of three types: PVC, EPDM and TPO. PVC membranes are not environmentally friendly, but they can protect against ultraviolet radiation and fire. 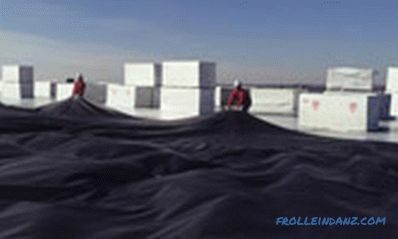 EDPM membranes made of artificial rubber reinforced with polyester mesh are durable and harmless to humans. TPO membranes are composed of thermoplastic olefins with mesh reinforcement. They are also environmentally friendly. Installation. The slope of the roof can be any, since the membranes are elastic. They are fixed to the base (solid) in various ways, the best of which is hot-air welding. 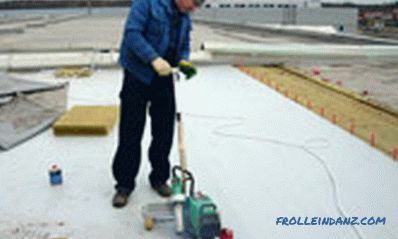 On the roof with a large slope attach membrane mechanically - special fasteners. If the slope is more than 10 0 , you can apply the ballast method, filling the roof with gravel. On complex roofs, membranes are glued. Scope. 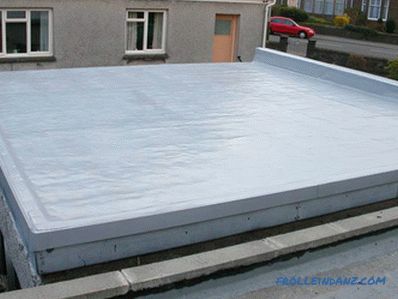 This covering is applied on rather flat roofs of residential or public buildings. Durability. The service life of the roof is up to 50 years. It is worth PVC furniture from $ 5 to $ 8 per square meter. solvents and organic oils can ruin the roof. 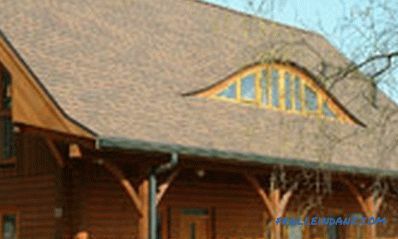 This roofing material is one of the oldest roof types, along with wooden shingles and slate. To make tiles, clay is burned at a temperature of 1000 degrees Celsius, after which it becomes hard and durable, and the color becomes brown with a reddish tinge. Some types of tiles before firing glazed to improve water repellency. Finished tiles (weighing 2 kg and more) have a length and width of 30 cm. 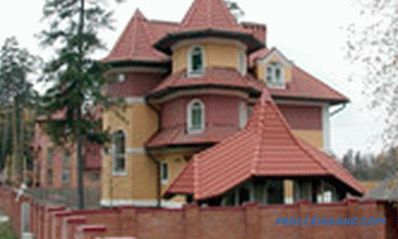 There are several types of clay tiles. Installation. 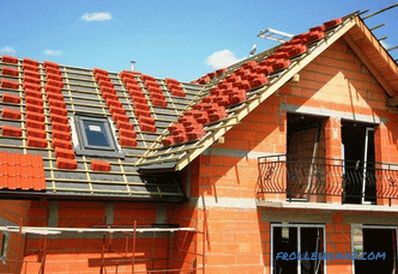 It is preferable to construct a tiled roof with a roof slope of at least 25 and no more than 60 0 .If it is less than 22 0 , then by all means it is necessary to provide a waterproofing layer and good ventilation. A slope greater than 60 0 will require more screws or nails for fastening. Separate elements (they are put with an overlap of the top tile on the bottom) are connected by special locks. 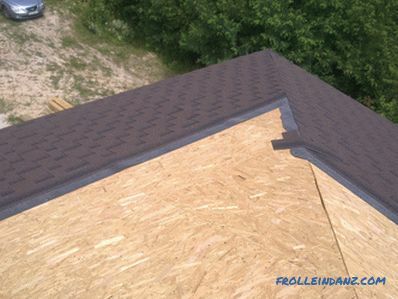 The finished roof has the appearance of solid scales, so that it has less opportunity to leak. Shingles are attached to the crate with nails through special holes. Scope. 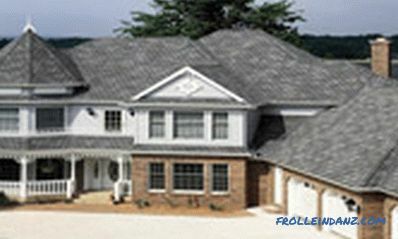 Use this roof to cover the roofs of brick, wood, and stone houses. The number of floors does not matter. Durability and price. The durability of such a roof is impressive - it can stand for 150 years without repair. However, not everyone can afford such a luxurious coating. 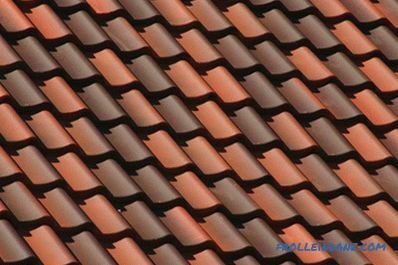 After all, its price per square meter ranges from $ 20 to $ 50.
the roof of the tiles is porous, it is able to "breathe", evaporating water. The sand-cement tile is lighter than clay, but does not last for so long. This piece coating is made from a solution of sand with cement that does not burn, but is pressed under pressure. Dye are iron oxides, making this tile look like ceramic. There is either glaze on top or no coating. The surface is made smooth or with a convex profile pattern. This roof weighs from 35 to 40 kg (one square meter). Installation. The optimal slope for mounting is from 20 to 60 0 . Fastening to the crate goes in rows through the holes in the tile. When this is done "ligation", equal to one second width of the tile. So called the shift of the series relative to the next. Rafters take a section of 5 to 15 cm, and the distance between them - from 60 to 90 cm. In addition to crates, a layer of waterproofing is needed. Scope. 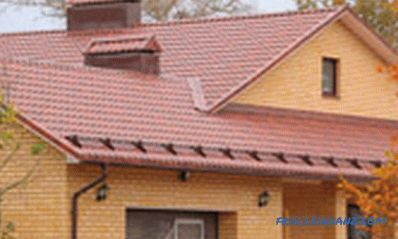 This roof, like the previous one, can be used in houses made of various materials and with any number of floors. Durability and price. For a hundred years, of course, it will not survive, but the manufacturer gives a thirty-year warranty. But the price of cement-sand tiles (from $ 10 to $ 20 per square meter) is lower than that of clay. And outwardly, they almost do not differ. frost resistance (1000 freezing cycles). Thickness compared with ceramic tiles - not less than a centimeter. the price is still high. Nature herself makes this beautiful material, using pressure forces and heat. Slate roofs can be seen in Europe on some ancient castles. However, if there is a desire, then we can also buy shale tiles 4 mm thick and weighing up to 25 kg (per square meter) from us. It is made manually, 15 or 30 cm wide, and 20 or 60 cm long. The roof is covered with a slate roof. Installation. 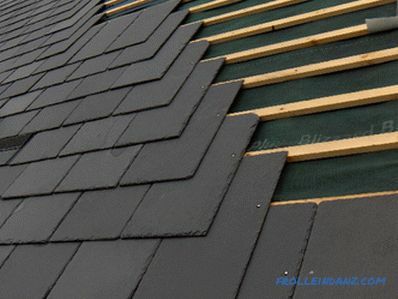 It is possible to lay slate on roofs with a slope of 25 0 . The crate is made of rafters, the cross section of which is 4 to 6 cm. We determine its step by dividing the tile length in half and slightly reducing the resulting number. Nails (copper or galvanized) for fastening are taken with a length of 9 or 10 cm. Two nails are taken for each tile; three nails are on the edge and at a slope of more than 40 0 . 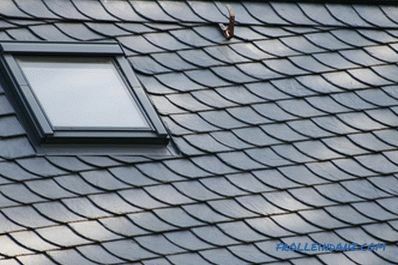 The principle of installation of a slate roof. Durability and price. The life of a slate roof is from 100 to 150 or even 200 years (provided that the base is properly arranged). It is worth one square meter of material 65-100 $. water resistance, frost resistance, fire safety. This coating, also called mastic roof, is a special type of membrane. 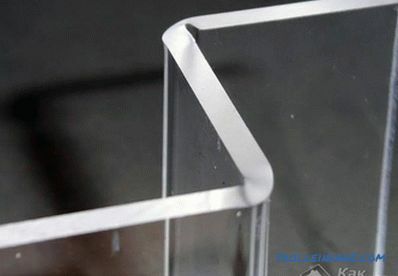 This is a viscous liquid based on oligomers. It freezes in the air, turning into a film with high elasticity. It has excellent adhesion to metal, concrete and bitumen - it is better to apply it on such surfaces. Mastic roofs can be unreinforced, reinforced or combined. Roof with applied polyurethane mastic. Installation. Mount the roof on the roof with a slope of not more than 25 0 . Flat roofs are best suited. With a slope of 2.5 0 reinforcement (fiberglass, glass bricks) is necessary. At the same time from 3 to 5 layers of an emulsion from bitumen with polymeric additives are poured. If the slope is small and the reinforcement is not needed, then a layer of EPIC emulsion is applied, and on top, several layers of mastic (with a total thickness of 1 cm). For the combined roof put down cheap rolled material, pouring it with mastic on top and sprinkling with stone chips. Scope. It is good to use it where there is a harsh winter or hot summer. 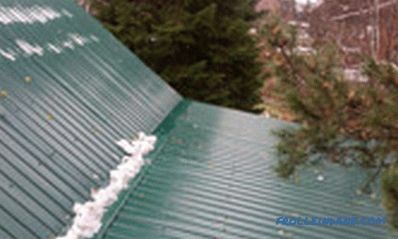 By the way, if the roof is flat, then with such a coating it can be exploited. Durability and price. A filling roof serves for at least 15 years. The price depends on the thickness and the contractor performing the work of the units to vary from $ 5 to $ 25 per 1 m 2 . 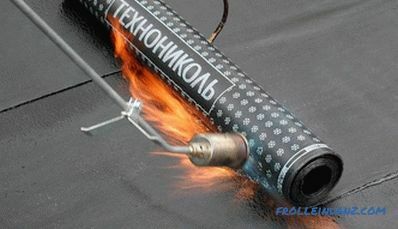 Resistance to fire and low temperatures. It is difficult to achieve a coating of the same thickness over the entire surface. So you learned what types of roofs exist. As you can see, each of them has its own "but" - there are no ideal materials. Therefore, choose coverage according to your needs and capabilities.